Eurasian Embassy in New Tarajan closed indefinitely. The Foreign Ministry announced today that the Eurasian Embassy in New Tarajan, which was attacked by a mob last week, will be closed indefinitely following the Tarajani refusal to allow additional security forces to be added to the detail already present. The Premier released a statement on the matter, saying "While we would prefer to keep diplomatic relations open, we cannot, in good conscience, keep our embassy in New Tarajan open in the face of such obstruction. The decision by the Tarajani's to place politics over the safety of our ambassador and diplomatic staff means that the we cannot ensure the safety of our embassy staff, and must close the embassy until the Tarajanis decide to allow our forces to defend our embassies. The Tarajani claims that their police can handle the crowds are laughable, and contradicted by Tarajani News Agencies! They reported that the police stood passively as the crowd grew agitated and only intervened after they grew violent. Thus, Eurasia does not feel that its embassy will be safe, and we have no choice but to order its closure. Thank you." The Foreign Ministry announced that the ambassador has already returned to Eurasia, and that the embassy staff are in the process of returning to Eurasia, with the embassy itself slated to be returned to the Tarajani government as soon as possible. 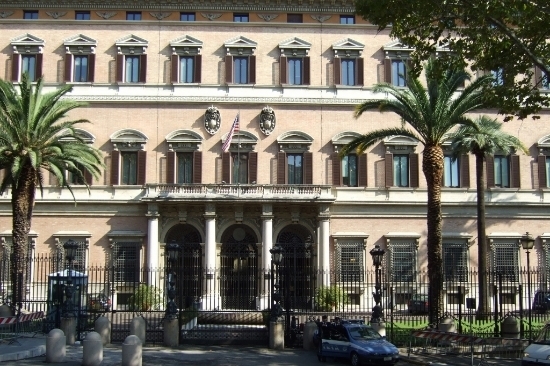 When questioned as to the future of the Tarajani embassy in Eurasia, Foreign Minister Margalo said "We expect the Tarajanis to close their embassy in Urbem Sol in response to our decision, but should that not be the case the Eurasian government will be forced to reevaluate the nature of the embassy." The Ministry of Defense announced today the intention of the ARROW Enforcer to join the military drills held by Duresia and New Tarajan in the waters of the second nation. The government, in the name of the good relationship that link from ever NT and Antanares, has decide to join the drill with the sending of the 7th Expedition Force, under the command of Commodore Yuri Andrevich, commander of the AMS Claudio and of its battle group. The carrier, one of the main nuclear carrier of the antanaresian fleet. During the operation the group will be composed from the Claudio, four ships of Touraine-Class, five of Weber class and two submarines. The Claudio, according to a note of the Ministry, will embark a group of Battle Mech and various stealth fighter for the drill. It is not the first time that Antanares and New Tarajan join a drill, epsecially in the last five years, that saw increased the military collaboration between the two countries in multiple field, from the construction of joint program to the furniture from one of the nation to the other one, for example, for the furniture to Antanares, from New Tarajan, of the new combat fighter Rafale. The Ministry for Foreign Affairs decided to allow Eurasia to place more soldiers in its embassy in the territory of Antanares. The government, it is write into a public note, will allow Eurasia to place more soldiers, considering the action "futile, considering the absence of any kind of menaces against the eurasian embassy in our territory". Antanares, in fact, was not hit from any kind of social protest after the leaks of informations from the NZSIS servers about the recent evolution of the Terran Federation program and the participation of the UPS in the death of the king and the queen of New Atenea. Members of the Bruma had proposed, in the last session of the Federal parliament, to start more investigation about the role of the UPS in the two deaths and proposed to close, in case of no-response from the "so-called progressive nations, how they call themselves" said a member of the Wolf Party, all the political collaborations and relationships between the UPS and Antanares. The proposal was blocked with a large majority of votes in the Bruma, considering also the good relationship that the Federation has not only with New-Zealand, but also with most of the country in the organization and, also, for all the economical and political collaborations created in the time. A week after the congressional and senate elections had taken place and ended with 4 parties occupying the two houses, the presidential elections came around the corner with 11 candidates but only 1 victor, Sir Aléandre Lizdt, whom was from the Progressivist Party which had gained majority of the votes during the elections that occurred last week. After assuming office, the first president of the new Federal Republic spoke to the mob that had assembled outside the Presidential Palace in his speech as such: “I can say one thing for sure - and that is the fact I’m not good at composing a speech. (crowd laughs) However, my status is an explicit honor to receive - but in this case - given - by one of the greatest people on Esamir - and to be made president by the fellow population of New Atanea is one of the greatest honors there is. (crowd applauds/cheers) I will serve my position with duty, respect and honesty towards our great, wonderful nation and its people - so I pledge my soul to this promise and those promises I make in the future and swear to stand by them for years to come. But like many others, I have set myself a goal - and that goal is to preserve and grow this country - and stay loyal to my allies, followers and the people of New Atanea until my last breath - with the sole intention to make New Atanea a nation of freedom, prosperity, happiness, culture, art and Progressivism. (crowd applauds/cheers)”. Now that Lizdt has assumed office, he will be faced with the responsibility to properly establish the Federal Republic of New Atanea and forge ties with whom it can trust but with the tensions that have arrised from recent growth of hostility between the UPS and SECURS, along with the assassination of the supposed King and Queen of New Atanea that was orchestrated by the Republican Movement and possibly multiple nations with a membership in the UPS. Just after the national senate had passed a legislation to increase the budget for the New Atanean Defense Administration, promising military projects already began sprouting and were quickly acknowledged by the NADA (New Atanean Defense Administration). These new projects will be included in the next military upgrade expected before the end of the year, among them being 2 highly advanced firearms and 2 next generation armored vehicles, the most interesting one being the PAK-TA, that even rival the technology of Atanea's UPS partner, Europe. The THOR A1 is a weapon like no other. It holds 50 rounds of 5.56x45mm and delivers the punch of a rifle in the dimensions of a PDW. With the simple press of a button the THOR brings buttstock and foregrip into firing position and delivers 100% CRISAT body armor penetration. 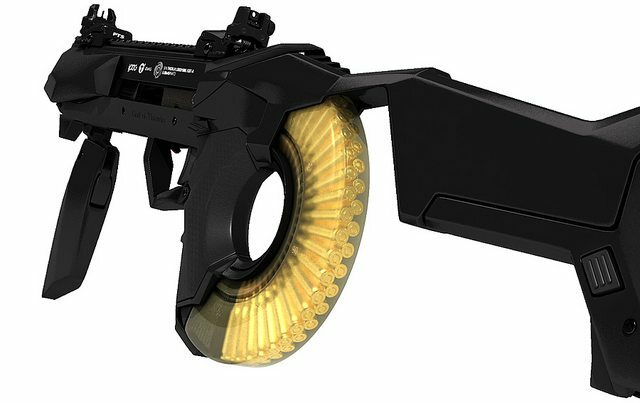 All this is possible due to an innovative new layout, enabled by the "cMAG", a magazine that's curved around the pistolgrip and the "Hammer of THOR", a bolt that moves up and down to reduce recoil and increase the rate of fire. The THOR A1 can be carried in a holster like a big pistol and quickly drawn and used in CQB. 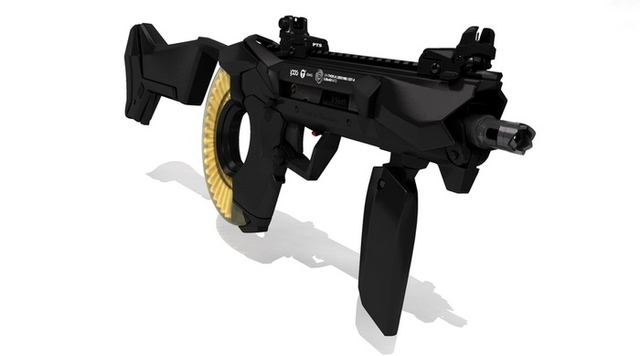 For more stability the springloaded buttstock and foregrip can be opened with the press of a single button. Both opened or closed, the THOR's innovative cMag can be reloaded quickly with the non-firing hand. All controls, including the bolt catch, magazine release, safety switch and charging handle are ambidextrous and easy to reach. The keytechnology enabling 50 rounds of 5.56x45 in PDW size is the cMAG. It's made from translucent polymer and positioned around the firing hand. The cartridges are stored in two rows with the last round being rotated 90° into feed position by a helical ramp. Not only is this layout extremly space efficent, it also offers a great weight-balance. The THOR combines a high RPM with high capacity, demanding and effective cooling system for the barrel and action. To achieve effective cooling the upper receiver is designed to work like an air-pump, moving air, through the weapon from front to back. The EPIC A3 with SIS-Barrel (Solenoid Induction System) and TEC-Shield (Thermal Energy Converter), the self-powered cal .50 rifle that will never miss a single shot. And that’s just the beginning. The SIS-Barrel uses four high-powered superconducting electromagnets to change the projectiles trajectory mid-air, as it leaves the weapon, to always hit your target, even if you’re not on target. The EPIC A3 with SIS-Barrel is the most accurate traditional ammunition shooting system in the world and the only handheld firearm that can hit targets without the need to aim. The SIS-Barrel is powered by the TEC-Shield, a high performance peltier element designed to instantly convert part of the thermal energy of the fired bullet into a short burst of high voltage electricity. The TEC-Shield is a next generation solid-state thermoelectric generator using the “seebeck effect” to instantly convert the extreme heat and pressure from a ultra-short barrel fired cal .50 round into a high voltage burst of electricity, lasting about 2.9 milliseconds, just enough to influence a flying projectile mid air. The Armata armored tracked platform has reportedly combined and assimilated all the last decade’s major developments and innovations in battle vehicle design and construction. The platform’s chief tank (T-14) sports an unmanned remotely controlled turret armed with a brand new 125 mm 2A82-1M smoothbore cannon. Its muzzle energy is greater than one of the world’s previously considered best cannons. The 125 mm gun has 15-20 percent improved accuracy and its rolling fire angular dispersion has improved 1.7 times. 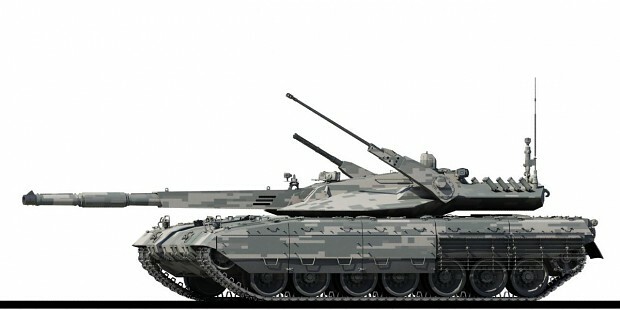 According to Atanean media, the Armata tank might also come with a specially developed 152 mm gun, the most powerful ever cannon to be mounted on a main battle tank. 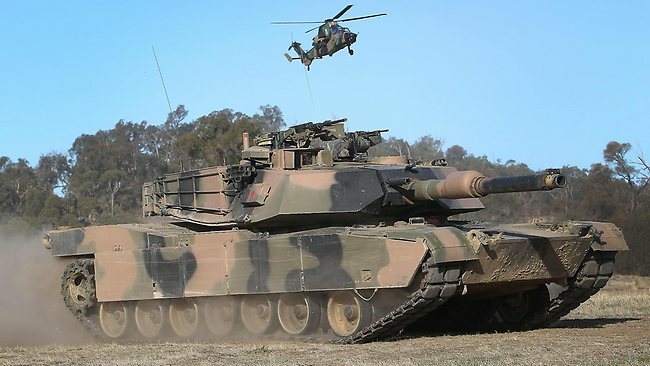 The tank’s turret will also carry a 30 mm sub-caliber ranging gun to deal with various targets, including low-flying aerial targets, such as attack planes and helicopters. A 12.5 mm turret-mounted heavy machine gun is reportedly capable of taking out incoming projectiles, such as anti-tank missiles. 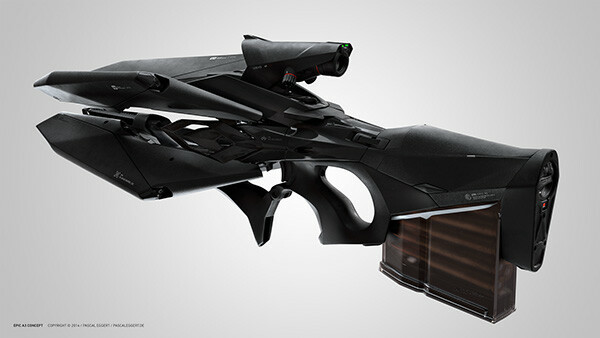 It’s capable of neutralizing shells approaching at speeds of up to 3,000 meters per second. The tank’s crew is securely enclosed in a multi-layer armored capsule separated from the ammunition container. The vehicle is fully computerized and only needs two servicemen to operate it. Each can also deploy the tank’s weapon systems. The tank’s targeting is reportedly done with an active-phased array antenna and a large variety of other sensors. The Armata platform allegedly has a fully mechanized electric transmission, powered by a 1,200 HP diesel engine. For greater efficiency, maintenance and repair schedules have been extended. Within its blueprint, the Armata armored vehicle has the potential to evolve into a fully robotic battle vehicle. A fleet of the latest PAK-TA transport aircraft will reportedly be capable of moving a strategic unit of 400 standard heavy tanks, with ammunition, to anywhere in the world. And probably at hypersonic speed, enabling New Atanea to mount a global military response. According to a new design specification from the Military-Industrial Commission in Dresden, a transport aircraft, dubbed PAK TA, will fly at supersonic speeds (up to 2,000 km/h) and will boast an impressively high payload of up to 200 tons. It will also have a range of at least 7,000 kilometers. The PAK TA program envisages 80 new cargo aircraft to be built by the end of next year. This means in a decade Atanea’s Central Command will be able to place a battle-ready armored army anywhere, Expert Online reports, citing a source in the military who attended the closed meeting. One of the main tasks of the new PAK TA is to transport specialized military hardware on the same platform, such as enhanced self-propelled artillery weapons systems, anti-aircraft missile complexes, tactical missile carriers, multiple launch missile systems, and anti-tank missile fighting vehicles. The PAK TA freighters will be multilevel, with automated cargo loading and have the capability to airdrop hardware and personnel on any terrain. A fleet of several dozen PAK TA air freighters will be able to lift 400 standard heavy tanks, or 900 standard light armored vehicles. “It means for the first time we have the objective of creating an operational capability to airlift a full-fledged army to any desired place on the planet,” the source said. This means delivering an entire task force, in a matter of hours to any continent. “In the context of the current military doctrine that defies comprehension,” the source said. The initial PAK TA specification entailed building subsonic air freighters with a conventional 900 km/h cruising speed and a moderate 4,500-kilometer range. 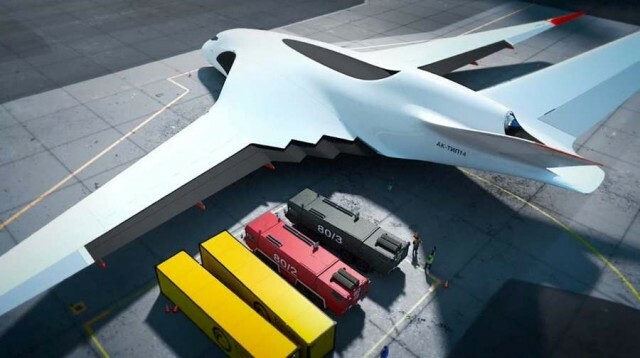 The program involves the creation of wide-body freighters, with payloads varying from 80 to 200 tons, to replace all existing army cargo aircraft. The only operating aircraft with a comparable payload is the Atna-225 (up to 250 tons). Air raid sirens reverberated through the Social Democracy at 9:32 this morning signalling a state of military emergency. A few minutes after these sirens were activated, multiple Eurasian jets were spotted zipping along over the nation, whilst large Naval armadas were spotted moving into position along the coasts. Since then the nation has been in chaos, with the NZDF calling in full mobilization and the police wearing full body armor whilst carrying military grade automatic rifles. As of now we are led to believe there is an incident occurring within the Grand Haven (Capitol) region, with police blockades preventing anybody from enterring the area, and the vast majority of the NZDF military might headed into the city. Grainy satellite footage indicates that a large contingency of Eurasian forces have crossed into the Social Democracy and made a charge towards the capitol mere minutes before the sirens were activated. We are yet to find out what exactly is happening within the capitol, as we are not able to make any contact with those within the city limits, as all communication seems to be jammed and all travel blocked. A twitter post from Anonymous at noon read "We warned you of what was to come. They have now come for you. Resistance is futile." It may be a speculation, but it looks like the NZDF is establishing a defensive perimeter and trying to retake Grand Haven. If I didn't know any better, I'd say we're being invaded... by Eurasia? Eurasian troops in a suburb of Grand Haven. Reports indicate that a Eurasian Army Group crossed the shared border with New-Zealand and pushed towards the Capitol, surrounding the Parliament Building before the NZDF could regroup and defend the country. Casualties are light to minimal, with many Kiwi soldiers too shocked by the sight of Eurasian troops invading their nation to mount an effective resistance. The Prime Minister surrendered following the surrounding of the Parliament Building, and now the nation, while not totally occupied, is effectively under the control of the Eurasian Military. Spectators everywhere, both Eurasian and Kiwi, were shocked by this unexpected move from the Eurasian Government, although analysts have noted the Kiwi Government's reluctance to move forward with the rumored Terran Federation plan, and this annexation may be the result of the Eurasian Government growing tired of Kiwi indecision. Inside the capitol, the Prime Minster announced that the current government had been dissolved before resigning his position. The military has not yet announced any plans for establishment of a new government, and for now seems content to oversee the affairs of the nation as via military rule. What is clear, however, is that Eurasia is, for all intents and purposes, the ruling force in New-Zealand. The Premier has yet to hold any press conference on the matter, as do any Cabinet officials, but the Senate has voiced its approval with the matter, with one Senator saying "Eurasia already supports New-Zealand in every conflict that happens where the UPS is involved, and we've backed them up and bailed them out numerous times in the past. Perhaps it's time we add a thirty-sixth commonwealth?" Whatever the plans of the Eurasian Government, this move certainly has brought the plans of the UPS nations into the light. After the assassination of the Atanean and Tarajani royals who were newly wed and even after the plot thickened to a great extent implicating many of the world's most powerful and respected nations the UKZ government did not release any statement. But immediately they were locked in intense debate in Parliament. However the parliament still has taken a clear stance on this issue. The parliament has never been more divided. “This is a wonderful opportunity for the UKZ to emerge as a support of world peace and order. This a wonderful opportunity to men our long history of hateful relations with Atanosia (now Atanea) and an opprtunity for usto prove to be loyal friends to New Tarajan. At the same time nations which have been implicated in this larger conspiracy must be made to explain themselves in the ECJ and hence be held accountable for their wrong doings..."
“Atanosia a constitutional.momarchy? Bleh. Made my hairs stand up and it made me sick. Monarchy is not an easy form of government. It is the fo of government for the elite only. I therefore believe that we must thank all those nations implicated in this conspiracy. For seeing what I saw in an Atananosia with constitutional monarchy. FILTH! If anything the UKZ must stay aloof during this conflict and disconnected.."
But it was soon apparent that disagreement existed within Partys of the ruling benches as well. “Break the relations, shut down their embassies. Such countries don't deserve to survive. They accuse us of being undemocratic and they go around imposing their ideologies and principles on other nations and other people covertly. But with the abolishment of the constitutional monarchy in New Atanea they have won. They have got what they wanted. We cannot let that happen. Therefore i propose we invite New Atanea into our Commonwealth Association of Nation's so they can recognize our monarch as their head of state. Details of the same can be negotiated..."
“This is all highly regrettable. But what can the UKZ now? Its all over and done with. We just need to give it a rest already. Let it go an ignore the whole incident. However, what we could do is force Atanea to expel all foreign personnel from their country. Plus its time we start clearing that border. The excess military personnel stationed there are a himderance to the daily life of the people of my constituency..."
With these widely opposing views and ideas. It is unclear as to how parliament will move but they will. Parliament will vote today on a resolution deciding the course of action. A vote the entire world will be closely monitoring. MONTERREY - Today Johnathan Walker is Planita’s new President. He gained the confidence of his party and members of Parliament to earn the Presidency. His pro-republican, social democratic agenda comes at a time of great tensions between Republicans and Royalists. Mr. Walker took the oath of office shortly ago at Parliament Hill where he is expected to form his Government. Johnathan Walker is already a notable President as he is a first in many ways for the office. Most notably he is the first Korrian, first Christian, and the first President be born after the formation of the Federated Republics in 1943. Mr. Walker may also be the first President to be elected in the midst of an international crisis. It would appear that Eurasia has invaded and occupied New Zealand an ally. The RHIELD Damavand landing in Astana, just after its mission in NZ. It was mostly unexpected. Or, at least, this is what the majority of people thought, hearing about the invasion of the Social-Democracy of New-Zealand by the Eurasian Commonwealth. But, apparently, this was not the case for the Tarajani Government. While confusing news were still coming from NZ, talking about possible invasion forces in Grand Haven, or the capture of the Parliament, New Tarajan was already moving itself to react. And the spearhead of the reaction was, of course, the RHIELD. Thanks to the collaboration of the NZSIS, the Damavand, the massive air mobile base of the organization, was landing in a military base outside the NZ capital city. When the Eurasian forces surrounded the city, the Damavand was already taking off, landing safely this morning in Astana. The mission: to rescue Empress Hayley Sunderland (who is a member of the House Van Vinkel), her family and friends and the Tarajani diplomatic staff. A mission which was a perfect success: from the Pasargade, the HQ of RHIELD, a spokesperson confirmed that Miss Sunderland is now safe at the Royal Palace, where she has been warmly welcomed by King Friederick, Queen Beatrice and Prince Sigismund. But this operation was only the beginning. The embassy in New-Zealand has been declared closed just few minutes after the news of the Eurasian invasion were confirmed. While the ambassador and the most prominent members of the diplomatic staff were evacuated by the RHIELD, the embassy will still function as a ground base for the Tarajani citizens living in the Social-Democracy, and who will leave the country. Indeed, immediately after the news of the invasions came in Astana, the government issued an immediate order for all Tarajani citizens in the Social-Democracy to leave the country: an hard decision, since Tarajani citizens constitute almost one third of the foreign population in New-Zealand; moreover, many Kiwi citizens share double-citizenship with New Tarajan. The same procedure was adopted about Eurasia and New Atanea: the respective embassies have been closed, the Tarajani citizens invited to leave the countries. It was only normal for New Tarajan to take such a step, after the news of the invasion. It was 3.00 a.m. in Astana, when a tired Prime Minister Van Houden held an emergency press conference at the Palace of Government, announcing the measures taken by the Tarajani government immediately after the news of the invasion reached the Kingdom. - the formal condemnation of the Eurasian government, now officially defined as "a rogue and terrorist State, acting in violation of International Law and norms." As such, no diplomatic recognition will be given, of course, to the invasion and to any possible consequence of it. - immediate stop of any trade or financial activity between New Tarajan and Eurasia; at the same time, all financial assets belonging to members of the Eurasian government and Parliament, to prominent businessmen and managers openly supporting the government and so on, have been immediately frozen. A decision which will cost to Eurasia billions, since the Tarajani banking system is the most advanced and developed in the world: many financial and banking institutions in the world are controlled, directly or indirectly, by Tarajani firms. - immediate seizure of all New-Zealand financial and industrial assets in the Kingdom: adopted in order to prevent the exploitation, by Eurasia, of any possible resource, this measure will lead to the seizure of all car manufacturing factories in New Tarajan belonging to the Chrysler Group. This, alongside the interruption of any trade and financial contact between NT and NZ, risks to lead to a catastrophic fall of the economy of the Social-Democracy (NT was the No.1 trade partner of New-Zealand, many infrastructure projects were financed by Tarajani business groups, and a gross share of the energy imports of the Social-Democracy came from New Tarajan). - New Tarajan will also immediately call for an intervention and official condemnation of Eurasia by the Security Council of the United Nations of Esamir, and its expulsion from the International Court of Justice. On the military side, the government has immediately raised the alert status to maximum level (Defcon 1). OMNI Enforcer is fully mobilized and ready to intervene in case of attack. The HARDENED web satellite system has been activated, allowing for a complete control of the military situation all over the Empire and beyond: the objective is to immediately identify any kind of possible hostile move by Eurasian forces and to immediately react with precision, efficiency and efficacy. Also the so-called Space Shield has been put on alert: this means that the Empire is now fully prepared to counter and disrupt any kind of ballistic attack against its soil. The name Space Shield is used to indicate the most advanced anti-ballistic attack system of the world: composed by a web of satellites, ground bases and silos, mobile ground, sea and air platforms, it allows a complete protection (a shield) of the Empire against any incoming ballistic attack. Meanwhile, the drills in East Karasin are still on-going, showing a perfect coordination between Duresian, Antanaresian and Tarajani forces. A powerful demonstration of force, just outside Eurasian coasts. Tarajani Rafales ready to take off in East Karasin. Exactly at the moment the massive Damavand was landing in Astana, the Duresian Prime Minister and Crown Prince were welcomed by King Friederick, Queen Beatrice and Prime Minister Van Houden at the Royal Palace, for their scheduled State visit in the Kingdom. The Duresian PM and Prince were also present when the Imperial and Royal Family welcomed Miss Sunderland in the Kingdom. The visit was initially planned in order to strengthen the level of cooperation between Duresia and New Tarajan in the wake of the crisis in New Atanea. It is hard not to predict that, with the newest developments on the stage, Duresia and New Tarajan will not proceed further deeper with their projects of cooperation and alliance, as also demonstrated by the on-going drills in East Karasin. No details are escaping beyond the walls of the Royal Palace, but it is highly possible that the two countries will decide to further strengthen the level of military integration and effectiveness to face the Eurasian threat. The Duresian PM and PM Van Houden will leave Astana this night, to fly to Velikogovolka, where they will consult with the Antanaresian government about what to do next. Calm during the storm: a peaceful photo of King Friederick (first at the right) and Crown Prince Henric (fifth to the left), with many members of the respective Royal Houses. The Ministry of Foreign Affairs also released a note late this morning, announcing that the first session of the Council of Ministers of SECURS will take place soon. No further details have been revealed about where and when the Council will gather, but it has been clearly stated that the main goal is to address the recent developments on the international stage. The request for the summit came directly from the Zackalantis government, understandlby concerned about what is happening. In conclusion, what can be said about the position of New Tarajan in this delicate and dangerous situation? Despite a direct attack against New-Zealand, no declaration of war has been issued. Every measure and movement taken by the government is purely defensive, or at least not directly aggressive. Astana is sending a message: we will not attack first, but we will defend ourselves, if needed. New Tarajan does not want a new global war. However, many inside and outside the government consider it to be unavoidable. The question is about who will shoot first. But the message is not solely for Eurasia and its allies; it's for the entire world. New Tarajan hopes to be a place for freedom, a place where all those who understand the terrorist and criminal nature of the so-called Terran Movement can find a safe haven. And it hopes to be so also with the help of the remaining allies: Duresia and Antanares, first of all, and also Zackalantis; and the Imperial States, of course. Now that all the necessary measures have been taken, the eyes are upon Velikogovolka: there, in the capital city of the most militarily powerful country of the world, the governments of Antanares, Duresia and New Tarajan will decided how to act next. And we will finally see also what the stance of Antanares about this entire issue is. We can only hope for the best. After the recent evolution of the event in New-Zealand and according to the disastrous intentions of the Commonwealth of Europe and Asia, the government of Antanares has decide to raise the alert level from the standard Six (no dangers) to 3 (credible danger). All the main bases of the ARROW and DRAGON Enforcers are ready to operate in full capacity, now or in the next 24 hours, with the 1st and the 2nd Fleet in alert state and all the rest of the ships in pre-alert status. According to this, all the non-necessary personnel from the embassies in New Atenea, Europe and Asia and New-Zealand were evacuated and the security was reinforced in all the three buildings. The citizens of Antanares, is write on the internet site of the Ministry of Foreign Affairs, are invited to leave immediately the three counties, contacting the embassy present in the territory or the nearest consular building of the Federation to start his or her return at home. The spokesperson of the Council of the Prince, Enrique De Letta, in a recent meeting with the journalists, proclaimed "The resolute condemnation of the Federation of the recent acts of aggression perpetrated from the Commonwealth of Eurasia against a peaceful and important nation like New-Zealand. An act that is not an aggression against the citizens of New-Zealand, but also against all the most important principles of freedom and Independence that are considered of primary importance in Antanares". In the little speech the spokesperson continued presenting the intention of the federal government to wait until an official resolution of the Security Council. Also, the government has decide to reconsider all the treaty that link Antanares and Europe and Asia, considered for now chilled. Not less important, Antanares will reconsider any kind of tie with every nations that would be found conspirator of the recent evolution of the world crisis. According to most of the analysts, Antanares is for now into a safe position. Protected from every sides from a friendly nations, can count on the most modern and advanced army of the entire Esamir, not the biggest but certain the most efficient and trained, capable of defend the country from any kind of menace and to protect the interests of Antanares, inside and outside the national territory. The Federation, according to the latest comments released from the Ministry of Defense, can count on an excellent war capacity, that, in case, would be used against any kind of menace. Antanares, according to the comments, is not scared from Eurasia or any other nations of the world, considering also a conflict the most inopportune and the most disastrous of the possibilities. Friends, good evening. I know you are all worried about Kaevi's particularly delicate state in the international scene, but hopefully I will be able to give you the answers you seek today. To begin, we affirm that we will not reintroduce a military. Second, all Kaevi nationals living abroad have been informed that it is their best interest to return to our nation immediately. All passports will be suspended within 72 hours. Also, all air and maritime international civilian transport out of the country will be stopped within 72 hours. Foreign merchant vessels will be instructed to dock at assigned ports elsewhere in the nation. On the matter of refugees from countries currently in turmoil or stricken by the atrocity that is war, they will be allowed to seek refugee status. Refugees will be allowed to live in Lisoone until told to either exit the country or seek citizenship at a later date. Note that while we do not anticipate an attack, our government has made the necessary preparations to ensure minimal loss of life. Know that the national government has evacuated the Liberation Circle area and to contact your local directorate for information on where to find the nearest Civilian Safety Shelter. Thank you for your attention and may love find you. BREAKING NEWS - Explosions and gunfire are being heard throughout the nation’s largest city as air raid sirens wailed signaling an attack. Planitan fighter jets roared overhead as pro-government light tanks and soldiers are attempting to restore order. We have word that Republican forces are attacking Royalist terror groups stationed in Liberia as they attempted a coup. Full scale gun battles between Government forces and the extremists are currently raging across the city and we are getting word of attacks in other cities nationwide. We have received word that all CORE forces have been mobilized and are being deployed to restore order. It would appear that several republicans and royalists forces have risen up and made themselves known. These include the the National Movement (Royalists), Indyellus Popular Front (Royalists), Liberian Republican Army (Republicans), the Democratic Unity and many more. It is estimated over 250,000 people are actively participating in the fighting nationwide. The appeal of nationalism and freedom and the exaggerations of threats against the other side bring in many sympathisers. It is highly suspected that they are involved and its the manifestation of national tensions. In the capital President Walker made a emergency speech to the nation. “Terrorism is a crime. You speak of establishing a new stable government that will guide Planita to a new age. I do not see this here, I only see death and destruction. I see a country sliding into chaos by the very forces that claim to be rescuing the country. I see terrified citizens wondering what happened to our proud nation. I see a nation amidst a chaotic world about to plunge with it. When you elected my party and me into office I swore I would represent you all. I am not just a Republican President, I am a Planitan President of you all. When our country was founded, their creators swore to establish a state where the people living in this country could live in peace. We are country of many different peoples, with different countries, languages, and cultures. We cannot lose hope of the dream now. I call the United Nations to send in a peacekeeping force to maintain order within my country. At this time of weakness we will accept support from our allies; New Tarajan and Antanares. Medical, Intelligence, and Logistics support will be appreciated. We warn Eurasia not to intervene in our affairs. Their attempts to establish a republic here will not be welcome . OOC: Here is a chance to escalate the RP. What you do here will determine if my country would become a monarchy or be absorbed into the Terran Republic in the future. Kill wisely. Oh f*ck it just invade me. Eurasian forces have hurriedly departed New-Zealand after it became apparent that the invasion was the result of a forced miscommunication between a border guard contingent and High Command. The Premier released a statement on the matter, saying "The attempted invasion was, I can assure the world, not ordered by any Eurasian officials or anyone in my cabinet. The military communications station in southern Vesperius suffered an internal breach that resulted in an order being given to the army to invade New-Zealand. The report indicated that the order had come directly from my office and that New-Zealand had suffered an armed insurrection and that Eurasian forces were needed to re-establish order in the capitol. Obviously, the reports are false, and the troops have been recalled before they occupied the entire country. We are looking into who or what caused this breach, and we have reason to believe that whomever undertook the infiltration was in possession of equipment that could break some of the most highly encrypted systems in the world. We do not believe that it was the work of any foreign government, but we are currently looking into whether groups such as Anonymous could have done so. I apologize to New-Zealand and the world for this grave misunderstanding." Thankfully, reports indicate that the Eurasian military did not cause any New-Zealand casualties, as the majority of the Kiwi forces who were guarding the border had also received false orders to let them pass. The Prime Minister has been reinstated as the leader of New-Zealand, and the Government has been reassembled following the forced dissolution. The Premier also spoke on the issue with Planita, where the Government is currently attempting to combat insurgents in the country who seek to overthrow the legitimate, if neutral, administration of President Walker. "Eurasia will not, as the President fears, be sending any military forces without the explicit approval of the Security Council." The Premier said. The situation seems to be in the Government's favor for the time, but it is clearly precarious and could shift at any time. Grand Haven once once again opened to the public this morning, and a sheepish Prime Minister took to the podium. "As I know many of you will be asking, what the hell happened yesterday? Well, the short answer is both Eurasia and NZ were played. Early this morning the Eurasian government received a SOS, fabricated so it seemed the message was supposedly from me, stating that a rogue NZDF commander had declared a coup and was attempting to invade Grand Haven and execute the parliament. At the same time, we received a tip off claiming that Eurasia would be invading us, as well as some well fabricated documents to prove it. At 9:32 yesterday, Eurasian forces crossed the border, planning on rescuing the Parliament, and NZDF forces took up defensive positions planning to protect the Parliament. Unsurprisingly Eurasian forces overcame the NZDF and stormed parliament. However, it is important to note that Eurasian forces used non lethal methods, such as stun bullets and tear gas, as they beleived the soldiers to be forced into this action by following the orders of a mad commander. Once they stormed Parliament house, we thought 'that's it, we're dead', but the Squad Leader goes on to proclaim they have arrived to rescue us and the 'evac transport is inbound'. At this point we realized something was seriously wrong, and relayed the order for the NZDF to stand down and likewise Eurasian commanders issued the same order. A secure video call with the Eurasian Premier quickly revealed that both forces had been duped. Grand Haven remained locked down for the rest of the night as we worked together to find out who or what was behind this. Eurasian forces pulled out in the morning and NZDF forces were told to return to base, Grand Haven was opened and all continues as usual. No casualties or serious injuries, and some trivial damage to buildings. However, the issue remains. Who would stand to gain from this? After a solid night of both nations devoting all their efforts to researching the messages, we managed to trace them back to a Royalist extremist group (formerly) based in Atanea. If this incident has proven anything, it is that regardless of what we think, or what we say, our nation will be seen as a Rebublican nation, and there will be countless Royalists intent on harming us. Thus, I am hereby announcing the Social Democracy's intent to join the Terran Federation. Today has shown us that our nation can be brought to it's knees by extremists, and the only way to ensure the safety of it's people is to join this Republican Alliance." A Tarajani MBT operating in Planita. Due to the recent crisis in New-Zealand, and the suspected Eurasian invasion, OMNI Enforcer was already at maximum alert level and ready to strike. Thus, it was only a matter of few hours before the first units of the Tarajani military began crossing the border with Planita, responding to the appeal launched by Planitan President Walker to New Tarajan and Antanares for a quick intervention in support of the government, against the Republican and Royalist factions which are fighting against each other in the attempt to take control of the country. For the moment, OMNI Enforcer has deployed the 15th Armoured Division, escorted by the 113rd Mechanized. As confirmed by Deputy Prime Minister Van Hagen, the goal is "to give support to Planitan forces in protecting key military and governmental structured, and avoid a further escalation, waiting for a full resolution of the Security Council." The Tarajani forces deployed will thus keep a strictly-defensive posture, awaiting for a resolution authorizing them to fully collaborate with the Planitan Government in order to quickly resolve the issue. Also full logistical, medical and intelligence support has been given to Planita, through the deployment of a number of transport aircrafts and vehicles, the authorization to use military bases and hospitals inside Tarajani border, and the share of information between Planitan and Tarajani intelligence agencies. Although not yet confirmed by official sources, it looks like New Tarajan is already trying to deploy a diplomatic initiative toward the fighting factions: particularly, rumors state that Tarajani diplomats have been sent to negotiate a first truce with members of the main Royalist factions in the country, National Movement and the Indyellus Popular Front. The idea would be to use the ascendancy of New Tarajan, as a recognized royalist leader in the world, to ease the situation for the legitimate Planitan Government. Meanwhile, Prime Minister Van Houden and Duresian PM have started their State visit in Velikogovolka. High level meetings are keeping the three governments extremely busy, discussing the recent developments and the next moves of the three countries regarding the most sensitive crisis in the world. A first result of the meetings have been the official adhesion of New Tarajan to the Antanaresian-led Union Sphere of Collaboration (USC), aimed at "improving the ties of New Tarajan with Antanares, Planita, and all the other members of the USC in a shared view of peace and collaboration." The participation of the Kingdom and the Empire to the USC will also contribute to the recovery of Tarajani economy after the almost-catastrophic fall of the stock exchanges following the crisis in New-Zealand and, now, the civil war in Planita. Prime Minister Van Houden also decided to speak, from Antanares, regarding the most critical issues on the table, announcing the official position of the Tarajani government about the recent events. First of all, the Prime Minister told about the crisis in New-Zealand, affirming that "what happened, has risked to put the world on the brink of a total collapse." "The responsibles for this vile attempt to undermine international peace are well identified by our intelligence agencies, and those of our allies: the group called Anonymous have finally shown themselves for what they are, terrorists." At the same time, the Prime Minister remarked that "no evidence indicates that behind the hacking attack there is any Royalist group. Any statement of the contrary is simply an attempt to blacken the reputation of Royalists in the world. No Royalist, and, I believe, no Republican as well, would have wished to see their most important countries destroyed by mutual destruction." Anonymous, consequently, has been put on the black-list of Tarajani intelligence and "we will hunt them, until the last one of theirs will not be brought in front of justice for their crimes." Very strong words, which however are well justified by the events: the fear of an Eurasian invasion of New-Zealand almost brought the two countries on the brink of total conflict, and caused a massive fall in the economies of the entire world, particularly hitting New Tarajan, No.1 trade partner of the Social Democracy until the crisis. Van Houden also addressed the decision of New-Zealand to join the Terran Movement: "We have no intention to interfere with the domestic decisions of other countries. However, it is clear that such a decision will have serious consequences for both our countries. ", a reference to the hostile relations between New Tarajan and the Movement, particularly serious also considering, as Van Houden did "that the Movement has probably supported the killing of the Atanean Royals. It shall not be forgot, indeed, that only their murder allowed the Republicans to take power in New Atanea, establishing a regime promptly recognized by the Republican Alliance. Or maybe we should believe these are only coincidences." The Tarajani Government will also keep its position of non-recognition of the Republic of New Atanea, nor the embassy in Eurasia will be reopened "until further clarifications will be made" about the issue of New Atanea itself. At the same time, the government stopped the evacuation of Tarajani citizens from New-Zealand, although the measure could be adopted again "should the need arise." The sanctions against the Eurasian government have also been revoked. PM Van Houden also addressed the position expressed by the Kaevi Security Administration: "We appreciate the attempt of the Kaevian authorities to protect their own nationals. However, we ask them not to leave the country. New Tarajan will do all its best to avoid conflict erupting, and we will always protect any foreign citizen living on our soil." Meanwhile, New Tarajan has to worry about the civil war in Planita. But the position of the government is clear: "We will protect the legitimate government of Planita, as they requested us to do, and possibly under a resolution of the Security Council." New Tarajan already expressed previously its intention to intervene through the United Nations of Esamir, an attempt also to strengthen their role in the international arena. But one thing is clear, and obvious: New Tarajan will not tolerate any civil war, nor the interfence of hostile forces, in a country with which it shares almost half of its borders. At the same time, the position taken by the Kingdom is a good demonstration of the willingness of Astana not to let itself dragged by political extremism, Royalist or Republican: many thought that New Tarajan would have sent its aids to the Royalists, but, instead, the government have choosen to help the legitimate Planitan government. No better message could've been sent to all thouse fearing the improbable "royalist threat". According to the recent events, Antanares is entered in the morning in the territory of Planitia to support the government of Planitia to maintain the order and restore the peace in the country. Antanares and Planitia have strong ties between them and are link with several treaties, like the Charter of the USC, the TAP and a collaboration act. According to the last news from Planitia, soldiers of the 33rd Paratrooper of the ARROW Enforcer are entered in the capital city of Planitia, entering in the main airport to construct a first base for the enter of the 22nd Air-mechanized Group, with the 9th Marine enter from the sea in the country to take the main port and avoid any kind of link between rebels and weapons dealers, that could refuel of weapons and ammunitions the rebel forces. The 12th and the 13th Mechanized Divisions entered in the country from the south border with Antanares, proceeding along the way to the capital city to search and destroy the main rebel position. Agents of SAOIRSE, in collaboration with the CORE Intelligence, will start the search of the leaders of the rebel movement. Antanares, that entered in Planitia in support of an allied country, will "give all the support possible to eliminate all the threat to the legitimate government". The forces of Antanares, for now, will maintain only defensive position in the sensible areas of Planitia, like the parliament and the strategic points like airports and ports. The forces of Antanares will avoid any kind of contact between rebels and eventually foreign fighters, weapons dealer and similar. The PM of New Tarajan, Van Houden and the PM of Duresia are arrived in the morning in Velikogovolka, capital city of the Federation of Antanares, for a trilateral talks about the evolution of the international scene. The two PMs were welcomed in the main airport of Velikogovolka from the Councillor for Foreign Affairs of Antanares, His Highness Duke Gerard Yeats, his staff and several parliamentarians of the Bruma, members of the main parties in the parliament. The two PMs were escorted from members of the AFS to the palace of Crystal Ices were they encounter Prince Higencourt and the other members of the Council. The three head of states started a series of talks. Also, not less important, after the discussions New Tarajan entered in the USC, one of the three major alliances in the Esamir. The NZDF has this morning announced that they will be deploying forces into Planita as a defensive measure. The forces are as of now tasked with peacekeeping, but the NZDF will be working closely with the Planitian government, which is currently controlled by a left leaning republican coalition. However, forces were informed that should the situation escalate, they could be transitioned from peacekeeping into active combat. Either way, the NZDF will be working on the command of the Planitian Government. The NZSIS announced in a press statement following the Tarajani pledge to hunt the organization down. The NZSIS announced that Anonymous is not under active investigation as a suspect, and has co-operated wholly with the NZ Government, one which has provided them protection for over 2 decades. The Director of the NZSIS went on to further say that members of Anonymous are NZ citizens, and are under the direct protection of the NZ Government, and any breach of their privacy would be taken very seriously. Long story short, the NZSIS has "reminded" the Tarajani administration that they have no jurisdiction over NZ citizens and that Anonymous is under protection of the NZ Government. Public sentiment was also on the side of Anonymous, with a recent telephone poll indicating that 83% of NZers feel Anonymous should continue to operate under the protection of the NZ Government, one which has famously been very liberal in regards to privacy and transparency. In related news, the Departement of Immigration released a statement indicating that there was no significant "evacuation" of Tarajani-NZ citizens to New Tarajan, and reminded the Aristocratic Kingdom that it's "evacuations" of it's dual citizens is frankly unnecessary, a gross overreaction and mostly hype. They went on to state that the government will not be supporting this evacuations and that any Tarajani citizen wanting to leave NZ can only do through the normal methods i.e. purchasing a commercial plane ticket out of the nation. 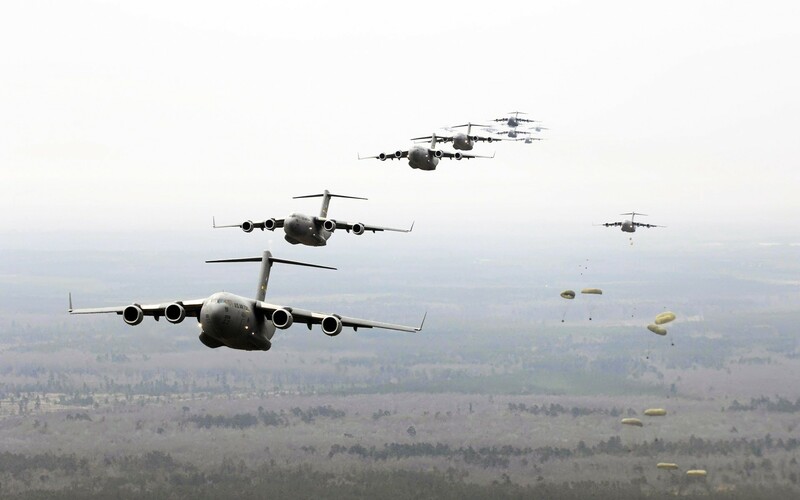 Tarajani forces such as evac transports are not allowed to land within the Social Democracy borders without explicit permission from the NZDF High Command. Lastly, as the immigration stats released prove, most Tarjani citizens (the vast majority of whom are also NZ citizens) have been residents of NZ for a long period of time, and would consider the Social Democracy home. Likewise, there are many NZ citizens living in New Tarajan who would be in the same situation. Honn Falls as Republicans Attack Tarjani, Antanaresian Forces. Royalists Ask For Tarjani Annexation And Threatens New Zealand. BREAKING NEWS - Republican separatists in the south have overthrown the government of Honn after a week long civil unrest. The Republican group called the Liberian Republican Army, claimed victory after they bombed the Government Palace, killing the Premier and most of the regional Parliament. Military and CORE forces loyal to the Republicans then seized and consolidated power in the region and established a new government. According to our sources, the detonation originated in the parking garage below the building. It is speculated that a bomb was sneaked in possibly by truck possibly with cooperation with Republican separatists. Federal Government sources say that the blast destroyed almost all of the Palace and destroyed or damaged many buildings in a large radius. It is not known as to how many casualties, resulted, it is expected to be in the hundreds. About 30 minutes after the attack, the separatists moved in and seized power. A statement was shortly made after by the leader of the separatists who established a base in a government building. “Democracy is weak in this country. The influences of legitimized dictatorships are strong in this nation as we are surrounded by enemies. In the past our forefathers overthrew the Indyellain regime and established a true democracy. It was a golden age as our people exercised a freedom long denied to them. Now Planita is too welcoming to the very nations support this barbaric form of governance. She has opened her borders to the rot of monarchy and yet they want more. To add insult to us, the royalists have forces on our own soil. The Tarjani and Antanaresian have invaded us with tanks and soldiers. And our Own Government has asked for it! Even more profound Tarjani is attempting to contact with the royalists at home! They clearly are supporting each other! Several hours this message was sent, Section 31 reported explosions and gunfire where the Royalist countries are stationed. PM Van Houden announces: "We want to keep peace, not to annex." While fights are escalating in Planita, with the Republicans seizing the government of Honn, in the south of Planita, New Tarajan spoke clearly about the hypothesis of an annexation of Planitan northern territory, as called for by a spokesperson of the royalist Indyellus Popular Front: "New Tarajan has intervened in Planita under request of the government of Monterrey. This government is our ally, and it is the only one which we recognize as legitimate in Planita." said PM Van Houden, still in Velikogovolka for a series of high-level tri-lateral State meetings between New Tarajan, Antanares and Duresia: "We are sure that the only solution, for both royalists and republicans, is to find a compromise with the government of President Walker." The declaration, which definitely removes any possible rumour of a support, by Astana, to the royalist demands, comes immediately after the Tarajani representative to the Security Council proposed a first road-map to resolve the civil war in Planita, including the official constitution of the first peacekeeping mission of UNE, the UNPKP (United Nations Peacekeeping in Planita). While waiting for the response of the Council, Tarajani forces in Planita keep their positions together with the forces still loyal to President Walker. The Ministry of the Military confirmed, through a spokesperson, that the hypothesis of an intervention through the air force is actually under scrutiny, in cooperation with the Planitan authorities. Tarajani soldiers patrolling in Planita. The Ministry of Homeland Security and Justice, through the Minister himself, Bailiff Prince Raimond Mathieu Van Geldern, in a press conference, responded to the latest statements from New-Zealand about Anonymous: "We have been attacked: the worst cyber-attack the world ever suffered." he said "And someone would make us believe that the author of this attack is some group of royalists. This is non-sense." "Until now, the investigations carried out by the KVD point to Anonymous." When asked about the statements of the NZ government protecting Anonymous, the Minister simply replied: "We will continue our investigation. They can cooperate; or they cannot. In any case if we will find them guilty in a definite way, we will chase them." Strong words, mitigated by Prime Minister Van Houden who, during his own press conference in Antanares, also briefly addressed the whole issue of Tarajani-NZ relations: "It is sad for me to see how the relationship between two historical, good allies have been deteriorated by the recent events. But we cannot accept accusations against royalist groups, while the most likely authors are others. Unfounded accusations cannot be tolerated." "However" he added "the Tarajani Government is keen to have faith in the Kiwi administration about the issue of the safety of its citizens under the "Terran Republic". We do not trust such "Republic", but we trust the Kiwis and their government." Meanwhile, in Astana, many await to hear if Miss Sunderland, rescued by RHIELD in the wake of the possibility of an Eurasian invasion, and honoured guest of the Imperial and Royal House, will come back soon in New-Zealand. The Tarajani Government has also expressed its will to restore, where possible under the new circumstances, the previous economic relations with New-Zealand. The decision has been made also in order to avoid a further strengthening of the economic crisis caused by the recent events which, however temporarily dammed, risks to inflict serious damages not only to New Tarajan, but to the whole world, due the strong financial interconnections. No exact details have been revealed about how much of the old trade partnership will be restored yet. After the entrance of the federal forces into the territory of Planitia, the Government had renovate its support to the only legitimate government of Planitia and, into a note, diffused a communique about its intention. "We recognize only one government. It is the only government elected democratically and it is the only government that has the right to lead the country. We will support the government of Planitia in all the ways possible". According to the recent news, the south of Planitia is in the hands of republican extremists. The south of Planitia is also the border with Antanares and two division of the ARROW Enforcer, the 12th and 13th Mechanized, were en route for the center of country during the rebellion in the south. With new orders, the two division are now located in the south of Planitia, with the goals to reorganize the loyalist CORE forces in the area and reconquer the region. The soldiers of Antanares encountered, according to the reports, few times the rebels, mostly of the fights were between little patrols. With the 9th Expedition Task Force in the national water of Planitia to block all the illegal weapons traffics that could support both royalist extremists and republican extremists, the two division can count on the support of the 10th Expedition Fleet, that has its base near the border between the two countries and on the 2nd Aero-Wing, that can count on the most modern fighter at dispositions of Antanares. The local ARROW Command, also, appears determinate to send the 14th Mechanized Squad, composed only by mechs, in the south area of Planitia, how support for the forces located in the area. 23rd Special Para-Forces started also an attack on the north of the region under the control of the republican rebels, to try to take on two side the enemy forces, concentrating its efforts on the logistic and radar infrastructures. The other divisions present in the territory of Planitia are the 33rd Paratroopers and the 22nd Air-Mechanized division, that took positions in the capital city of Planitia to defend the city against any try of the enemy forces to subvert the legitimate government. SAOIRSE, the intelligence service of Antanares, published the expanded Blacklist, up to date after the recent events and crisis. The Blacklist is a memorandum, a list of all the organizations and the group considered terrorist and a threat for the Federation. Normally, if necessary, states can be added to the Blacklist, like Panem during the "Game Crisis". Now, according to the SAOIRSE, new organizations were add to the Blacklist. The first new entry is Anonymous, considered responsible of cyber-attack against federal infrastructures and put on the head of the list. For what we know, the SAOIRSE and the AFS are ready to track and eliminate all the members of the organizations and started a series of investigations on financier of the cyber-group responsible for the diffusion of false information about the state of the relationship between New Zealand and Eurasia and that escalated almost to a war. In the Velikogovolka Journal of the day, was write about the arrest of two members of Anonymous, two young hacker just known from the authority and under control from the police. The two, one man and one woman, were find in the same house during the night and put under arrest with the accuse of cyber-terrorism and transferred to the Military Prison of Cape Vulcan. "We consider Anonymous responsible for all a series of infractions. We don't know if its the only responsible of the situation and if is present an invisible hand that guide its movement, but we can't allow that a group like this to operate without restriction" said the responsible of the cyber-warfare department of the AFS, Gregor Villanvich "We will fight against all the enemy of Antanares, that they are royalist, republic, communist, anarchist or what else"
National Movement , Indyellus Popular Front , Liberian Republican Army and the Democratic Unity are the other four new groups in the Blacklist of SAOIRSE. The four group, responsible for the rise of the tension in Planitia and the explosion of a violent civil war in the allied country are considered, from now, terrorist groups. That allow the forces of Antanares to the use of the force against them and the FMSS to start investigations about to find any link and clue that could help to eradicate them from Planitia. Forces deploy as part of the peacekeeping operations. The Ministry of Defense announce today that the Eurasian Military will deploy forces into Planita to join the UN Peacekeeping force already in Planita, and will operate under the command of the Planitan and UN Governments. With the reports that rebel forces have seized cities throughout Planita, Eurasia has reiterated its support for the legitimate, democratic government of Planita. "The Planitan Government is the only legitimate voice of the Planitan people. We condemn in the strongest terms any who would attempt to overthrow the legitimate Government of a nation." The troops who deployed will for now engage in peacekeeping roles, but are ready for active combat should the need arise. 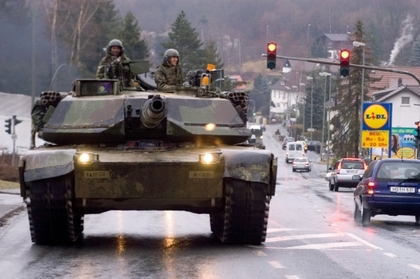 Forces deployed consist mainly of the 475th Infantry Corps, the 364th Engineers Corps, the 69th Military Police Division, and the 102nd Armored Division. The 364th will mainly be rebuilding destroyed areas and providing aid to beleaguered civilians, and will also work to repair damaged power lines and other critical infrastructure. The 69th MP Division will focus on maintaining order where the police force of Planita can no longer function, as well as patrolling government-controlled areas to keep them safe from insurgents. This division recently saw action in Atanea, and was redeployed to aid in the peacekeeping efforts. 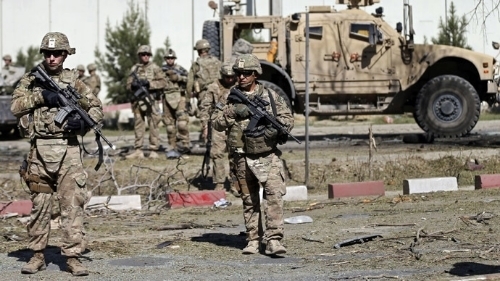 Finally, the 475th Infantry and 102nd Armored will focus on combating the insurgents on both sides, as well as providing logistics for the UN forces. "While Military Intelligence does not harbor any great love for Anonymous, and traditionally we have been at odds in the past, we can definitively conclude that Anonymous was not involved in this data breach. While it would seem to be an action that would be in their favor, they know and we know that the first action of an invading army would be to eradicate any opposition, especially opposition that is information-oriented." "We can find no evidence that Anonymous was involved in this breach. While it would not be in Anonymous' favor to have a Eurasian invasion occur in New-Zealand, a breach that infiltrated some of the most heavily encrypted computers and radio channels in the world is simply beyond Anonymous' capabilities. They have risen to fame mainly because they can hack relatively unsecured corporate and low-level diplomatic communiques. A military electronic system is simply out of their league." PLANITAN EXCLAVE AT ZACK MERCY? An exclave of Planita, south of the zack Commonwealth Territory of Telmar is surrounded by zack territories and the UKZ military is virtually holding this exclave hostage. No reports of the royal armed forces entering the Planitan exclave have been verified yet. But a recent joint statement from the ministry of defense, Commonwealth affairs and international affairs makes it clear that His Majesty's government is using the Planitan exclave to end the war. “The Planitan Exclave is very well at the mercy of the UKZ. We are a responsible nation that will go to.any and all means to ensure international peace and stability. We believe that this is our responsibility as members of the international community. The UKZ has not violated the independence of this Planitan exclave but will be forced to do so untill and unless the fighting in mainland Planita ceases. The UKZ just like our other royalist friends are above petty fighting among Republicans and Royalists. We want peace. So if the fighting doesn't stop in Planita, if people with opposing ideologies in Planita fail to make government by using the proper political path then this exclave of Planita might just join the zack Commonwealth. We await a Planitan response". Government Forces continue to sustain setbacks in the fight against both Republican and Royalist extremists. It has been about a week after the sudden outburst of violence sent Planita spiraling into a crisis of international proportions. The President is in Parliament Hill today, discussing with foreign diplomats and an emergency session of Parliament. Barely two weeks into her Presidency, she is currently grappling the largest national crisis since the formation of the country. Government forces barely control the city of Allica in North Korria today, after taking heavy casualties since a surprise attack by Royalist forces. Home to the few places where open combat takes place, the carnage is extensive. Soon after the outbreak of violence, local CORE forces moved in to restore order; however continued bombings, drive by shootings, and open gunfights ravaged them. It is hell here. We do not have the capability or the resources to continue this fight much longer.” said a CORE Unit Commander. Indeed the Director of the Central Organization for Realm Enforcement (CORE), say their units are primarily for short duration crises like hostage taking, not extended periods of intense warfare like the current conflict. Even more, military units are not authorized to attack as this is still technically a civil crisis at the jurisdiction of the States. With the current rate of casualties, CORE forces continue to withdraw, losing several important sites including a weapons depot and an industrial complex. Both were razed after the retreat. All military forces are at Alert Level 1, the highest official alert level possible. All naval vessels are being deployed off the coasts of the trouble areas with the First Fleet being withdrawn to Planita with ”due haste.” All ground forces are mobilizing and are moving north and south to the troubled areas. They are expected to reach the fighting in two days. The forces of Antanares continue their fight in the south region of Planitia. With the full support of the 2nd Aero-Wing the forces continue to push against the rebels in the south. The 14th Mechanized Division, composed only by mechs is arrived in the area of the operation to support the 12th and the 13th Divisions, that were en route for the central region of Planitia before the fall of the south in the end of the region and their consequentially re-direct in the area to join the loyalist CORE Forces and help with the battles. With the 9th Expedition Fleet that operates in the waters of Planitia, the land operations have a full support from both air and land. SAOIRSE, that operates in the area with various agents, has start a large investigation about the vendors of weapons in the zone, to track and hunt them and eliminate one of the main supply road of the republicans in the south of the country. With a new decision, also, the government has decide to increase the support for the planitian government, with the sent of supply convoy by air and land, at least where the passage is safe, to supply the loyal CORE forces and the cities under siege from the rebels. The intention of the government is to avoid any new fall of cities under the government control, reinforce the position and prepare, in sight of the new act of the Security Council and the relative arrive of new troops, for a new counter-attack. The forces present in the south, almost, will continue to fight against the rebels with the usual tactics: rapid and fast attack against the enemy positions, from more sides and with various goals, like radar structures and infrastructure. Special forces are in all the territory, acting alone and with the support of the CORE forces in zone to operate against the rebels, signing the enemy positions for fast strike of the aviation. After the arrest of the young couple considered linked with Anonymous, now in the Blacklist of the Federal Government and considered a terrorist group, voices raised from various social group and position with different point of view about how the government must affront the consequences of the arrest, the penalty for the couple. Arrested from the AFS, the two are now in a federal prison, with various accuses, like one of terrorism. And, how everyone know, the terrorism is probably the last crime where is expected the death penalty, how extreme measure, even though the works of the left-wing to eliminate this last trace of what is considered "an atrocity". "They are only two youngs that follow an ideal" said the member of parliament Alexander B. Brovich, member of the Left Wing "We understand that they violated the laws of this country, but they have only sixteen years, they don't deserve a similar atrocity. I think we can find a some of third way, like a ban from operate with computers in the next six months. We are not barbarians. At least, we must be not barbarians". "When you have the intentions to violate the law, understanding this, you must affront the consequences" said another member of the parliament, Mark Armstrong, member of the Right Wing and in particular of the Wolf Party, one of the main supporter of the actual government and Prince "They violated the laws and they knew that similar acts are a dangerous hobby. If the Federal Counter-Terrorism Court will use the death penalty, it must have the freedom to use it. We must not block the Justice". According to a report from the AFS, Anonymous tried to launch a series of attacks in the night against the server of AFS and SAOIRSE like a sort of counter-attack for the arrest of the two, a man and a woman, exactly a couple. But, with all the defenses in high alert for all the situation in Planitia and for the dangers of new cyber-attack, the terrorists failed to insert a virus in the server and to hack the internet sites. Government Placed Anonymous Leaders in Protective Custody, Begs Remaining Members To Cease Operations. The NZ Police revealed today that many "Anonymous" leaders have been placed into protective custody following what the Police Minister termed a "witch hunt" by New Tarajan. 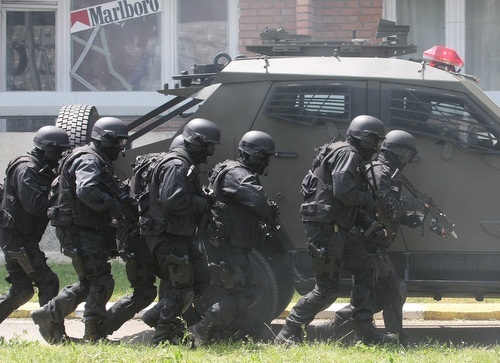 The NZSIS, Eurasian Special Forces and the Prime Minister himself, have all spoken out in defense of Anonymous, with the prime minister even going as far as to quote "the corrupt fear them", a line from the Anonmous recruitment chant "The Corrupt fear us, the honest support us, the heroic join us". 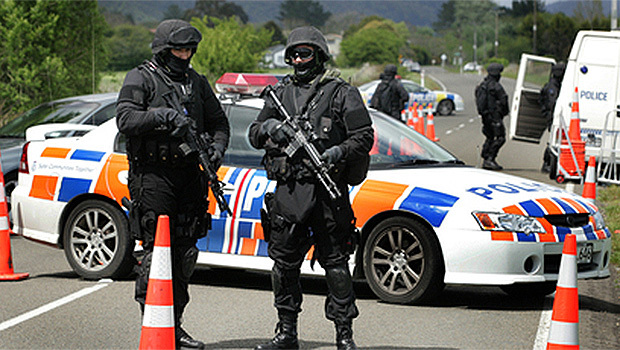 Following the arrest of two Anonymous activists overseas, and the refusal of the Tarajani administration to recognize Anonymous' innocence, the NZ Police have placed many key members of Anonymous, all which reside in New Zealand, in protective custody in various places around the Social Democracy and within Eurasia. Furthermore, the Police Minister urged all Anonymous members to cease all operations for now. However, this was followed up by the NZSIS announcing that it is looking for any veteran Anonymous members who would like to temporarily or indefinitely join the NZSIS and help with their information gathering and other cyber operations, something which Anonymous members are extremely skilled at. Ms. Sunderland, could you tell us why you remained in New Tarajan even once the invasion threat was cleared? Well, I remained in the Kingdom for a while because the Government wanted me to converse with the King and see where exactly future relation between our countries would be going, and try and smooth out the issue with Anonymous. As far as future relation go, it doesn't look like the Kingdom or the Social Democracy will be getting any closer, but trade will continue unaffected for forseeable future. As long as sh*t doesn't hit the fan too badl... uh, am I allowed to say that?... anyway, as long as things don't go too badly, we can still look forward to healthy economic relations between these two nations. Well, that side of things didn't go too well. It seems very unlikely that either New Tarajan or Antanares will ever give up their hunt of Anonymous, and they seem damn certain that the Hactivists are the enemy. Somehow being a whistleblower is now terrorism. I was a member of Anonymous as a teen, did you know that? Yea, seriously. I wasn't a high level hacker or anything, but I did a bit, attended a few rallies wrote a few articles on our findings, that sort of stuff. 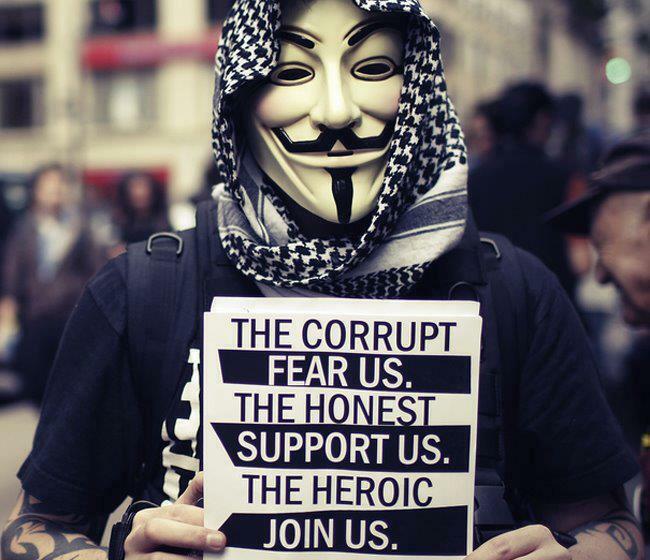 So I most certainly support the positions of New-Zealand and Eurasia on the matter of Anonymous. Do you have any opinions on the Terran Federation? Frankly, I don't really understand what the Federation is, or what they plan to achieve, but I trust the Prime Minister and his government to make the right decision for the Social Democracy. All I know, is Lenin would have wanted us to join the Republicans, and as Empress I guess my job is to ensure his legacy lives on. So yea, I guess I do support the Terran Federation. One thing I know for certain is Eurasia has our backs. Like when the invasion started, what was the first thing Tarajan did? Attempt to evacuate their citizens, barely any left, but still, what kind of show of support is that? On the other hand Eurasia mobilized all their forces and acted in a heart beat to protect our parliament from what they thought was a military coup. I have to agree with what the Prime Minister that day, we now know who our true allies are, and frankly, if Eurasia joins the Terran Federation as a senior member, which they have already indicated they will, then by all means, I think we should join them. From the Pasargade, the HQ of RHIELD, comes the definitive confirmation: early this morning, the RSS Iliad, one of twos RHIELD aircarriers (the other being the Shalimar submarine carrier), launched a strike against a safehouse of Anonymous, the notorious terrorist group. The attack, carried out by two Rafales embarked onboard the ship, was preceded by a cyberattack which completely isolated the safehouse, located on an isolated cliff inside the Arveyran territory, and which also housed a server for the activities of the group. "The safehouse has been completely destroyed." stated a spokesperson of the organization: "Intelligence confirmed that, previously, that same server was used for many attacks against Tarajani and other Imperial institutions, and that the group was already preparing a new hacking operation. The quick intervention of RHIELD avoided the possibility of such an attack against us and our citizens." No people was, at the moment, inside the bulding. The seven members of Anonymous responsibles for its running have been captured by a RHIELD tactical team immediately after the attack in a nearby village, and are now onboard the Iliad for interrogation. According to the sources, three of them are Tarajani, one Arveyran, and one Antanaresian. The citizenship of the remaining twos is still covered by secret.